Whatever the weather, this contact grill gives you that great backyard barbecue flavor direct from kitchen while it promotes healthy, low-fat cooking. 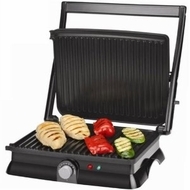 Premium non-stick surface sears perfect steaks, chops, burgers, veggies and panini as fats drain away into the external drip tray. Large cooking surface feeds the whole family. Floating hinge adjusts to thickness of food or opens flat for double the cooking surface adjustable temperature control for perfect cooking with maximum control. Adjustable grill height fits your favorite foods.